When I think of great American Icons, Rocky Mountain ranks pretty high on the list, right up there with Grand Canyon and Yellowstone. 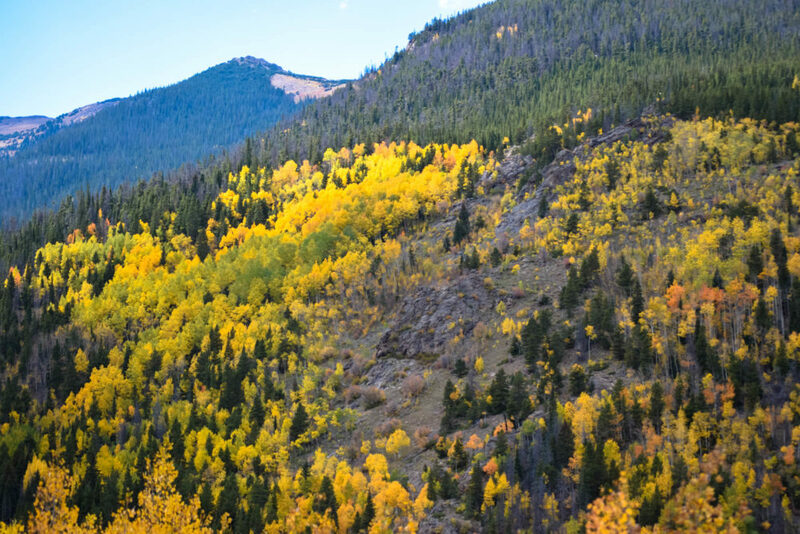 I picked October to visit Rocky Mountain due to the famed aspen autumn colors and the elk rutting displays. I regret that we could only stay a week, but we got to experience some pretty awesome hikes and wildlife in that time. As you can guess by now, I like to include at least one good scenic drive when visiting a national park. I think it’s a great way to get an overview of the area and helps with figuring out what we want to do next. For Rocky Mountain, we went with Old Fall River Road. 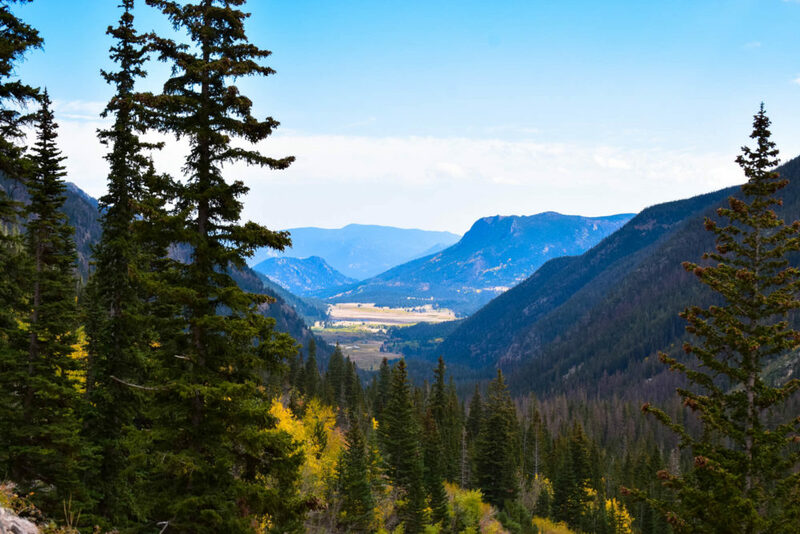 In 1920, Old Fall River Road earned the distinction of being the first auto route in Rocky Mountain National Park, and the first route over the Continental Divide. The road allowed access to the park’s high country, but unlike Trail Ridge Road, which is well known for being the highest continuous paved road in the nation, Old Fall River Road is more of a motor nature trail. Before hitting the road, I suggest going to at any visitor center bookstore and getting either an audio tour CD or booklet guide. Also, check for road status; Old Fall River Road can close during winter and is subject to the occasional maintenance. This one-way uphill narrow gravel road, tight with switchbacks, requires a slow and cautionary pace. For 11 miles, the driving trail lead us from Horseshoe Park, through the park’s wilderness, and up to Fall River Pass, which is over 11,700 feet above sea level. We passed a few signs indicated a speed limit is 15 miles per hour and for good reason, there’s plenty of loose rock, no guard rails, and punctuated with narrow curves. Thank goodness Old Fall River Road is one-way going up! There were a few times, I could reach out the window touch those yellow and orange Trembling aspen trees. Oh, there are conifers such as Ponderosa pine, Engelmann spruce, and Rocky Mountain Douglas-fir, but I wouldn’t want to scrape my hand against those needles even though they smell like high Christmas season. Long ago, this trail only serviced Indian Hunters on their way to find game and the occasional trapper once European settlers moved in. In 1913, before the establishment of Rocky Mountain National Park, the state prison inmates carried out the early construction. The laborers were forced to build a three-mile stretch of road to Chasm Falls with no more than hand tools. Officials discovered that the convicts made little progress, so they hired contractors to finish the road. I can’t imagine climbing this road on foot! Let alone be built by hand. Just before we start driving over a dirt road, we pass a messy assembly of boulders on either side of the road. There’s a short trail here and I can see a forest slowly recovering. This area is known as the Alluvial Fan and reminds visitors of what happened there in 1982. One July day, the Lawn Lake earthen dam failed and released 30 million cubic feet of water. The flash flood killed three campers and caused $31 million in damage to the town of Estes Park, Colorado, and neighboring areas. The waters rushed down the Roaring River valley and scoured out a large gully out of the mountain stream. Water flowed at a peak rate of 18,000 cubic feet per second, which meant the lake emptied in only about a half an hour, and left uprooted trees, mud, and boulders deposited as far as Estes Park. After the falls, the road continues climbing passing into a subalpine ecosystem filled with Englemann Spruce and fir. There are a few windows between trees where we can see down into this spectacular valley. At Willow Park, I take out my binoculars and try to spot Elk and Mule Deer, but it looks like they’ve gone deeper into the valley. Soon we reach Fall River Cirque, a birthplace of glaciers that once worked their way up and down the mountain valleys. With the glaciers gone, all that’s left is a landscape which looks like someone took a giant scoop out of it. We then head up a headwall of an amphitheater-like formation before joining Trail Ridge Road near the Alpine Visitor Center at Fall River Pass. Alpine Ridge Trail also starts here, but we forgot to bring warm clothing and won’t dare take the hike in shorts and t-shirts. Instead, we head to the visitor center and comfort station. We take a much-needed break and some lunch, before taking Trail Ridge Road back to town. Old Fall Road seemed short, and I wanted the ride to last longer. The views were spectacular and worth the drive. I’m glad we were able to drive it before it closed for the winter season.